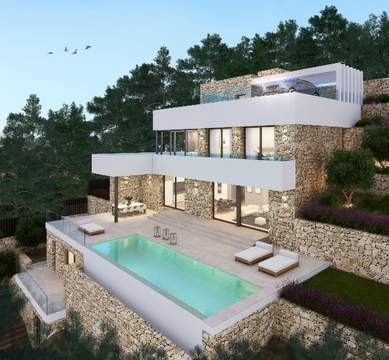 We will be constructing this villa, a new-build which is certain to receive much attention, high above Moraira with a superb 300 degree, panoramic view towards the sea, as far as the Peñon de Ifach and the picturesque hinterland, encompassing the vivid silhouette of the Montgó. The magnificent 600sqm villa, with 4 bedrooms, 5 bathrooms, not to mention a sitting room with a ceiling height of 6 metres, a kitchen and dining area, as well as a 12m x 4m infinity pool with glass frontage, surrounded by a spacious sun terrace. It goes without saying that under floor heating, a centralized air-conditioning system and fittings that include an intelligent Domotik System will form part of this home, but not only that, a spa and gym, a whirlpool, sauna and a heated interior pool of 6m x 2m, as well as a home cinema room will be additional attractions. Completion is expected 10 months from the commencement of construction. Anyone wishing to get their own idea of the outstanding build-quality and impeccable fittings, as well as satisfying themselves regarding the excellent price opportunity on offer, is welcome to view our other new-builds in Jávea. Here, potential buyers will be able to gain an impression of the high-quality PORCELANOSA materials being used, which may also be applied in this particular house in Moraira, should they so choose.